Did Canada’s Confederation women give birth to the new dominion in 1867? Sir John A. didn’t have women in mind when he made his statement (above) about entering history. He was mainly referring to himself. And yet, when one thinks about the homeland (patria, female), it is often as a female figure – the mother country – and the nation itself (la nation in French and gendered female also in many other languages) is delivered by someone (also female?) capable of giving birth. So presumably women have a role to play. Canada is counting down now to a big anniversary, the country’s 150th birthday, fast approaching on July 1, 2017. Whom and what will we remember as we commemorate and celebrate this anniversary? That’s what the government, too, has been asking. Following consultations and parliamentary heritage committee meetings, recommendations have been issued. The Department of Canadian Heritage is positioned to guide the official festivities. Its website features a timeline to the big event – pithily titled Canada 150. Other “key milestones” along the way – most notably the bicentennial of first Prime Minister John A. Macdonald’s birth – undoubtedly set the stage. Naturally, remembrance of the “nation-maker” himself and the other “fathers of confederation” will feature prominently. Bravo! Sounds like a good plan to me. There’s always a ‘but’ though. While reading the government’s program something struck me. An absence. Something was missing. Or rather, someone was missing. A whole lot of someones, actually. All the speeches and pages of reports don’t mention the word “women” or “woman” a single time. Where were the women? I don’t mean to pick on Minister Glover (or on the parliamentary committee, for that matter), but doesn’t ensuring “where we came from” have something to do with the women who, ahem, have something to do with the existence of generations and generations of Canadians? And who, even if they are not mothers in the biological sense, still contribute to the weave (to use a feminine metaphor) of Canadian life? So, where are the women? Perhaps the rationale for – shall I use the ugly word? – excluding women is that women have now reached the equality that makes it unnecessary to include them explicitly. I am certainly not the first, nor will I likely be the last person to observe that such equality still eludes us. In some respects, second-wave feminism might even be considered a failure, if for no other reason than that women now feel they have to do absolutely everything whereas before they were ‘just’ in the home. Whatever one thinks about our current status, though, gender equality is absent from history, which really is much more “his” story than “hers.” Perhaps history repeats itself – and that’s not generally thought to be a good thing – because of the prevalence of some stories and some ways of storytelling over others. Let me be clear: I do not believe, nor do I wish to pretend, that women in 1867 steered the course of Confederation (or the course of history, in general terms) in exactly the same, or even in similar ways, as men. Of course women weren’t the politicians who negotiated the treaties and signed the official documents. How could they have been? It’s a bit difficult to lead the nation if one is not meant or expected to be, nor by conventional standards thought to be suited for, the public sphere. Even so, Confederation is a big topic in Canada, and others before me have noted that there were indeed women around then too, and they might just possibly have had something to do with the building of the nation, if not the signing of the treaties. Just imagine! Certainly, at the latest after Moira Dann’s article some years ago in The Globe and Mail – not an obscure academic journal or book that no one reads – entitled “Where were the Mothers of Confederation?”, I had hoped that what Dann calls the “distaff dimension” of Canada’s Confederation would also be of interest (along with the female side of the rest of history, in the most sweeping way), not just the male aspect. Can we really fully reflect “on what we have achieved” as a country, “promote a strong sense of pride and belonging for all Canadians,” and “move forward” as a nation, as the parliamentary report announces, if women are not part – explicitly – first, of national remembrance related to Confederation, and, second, of a future-oriented national dialogue? How are we “getting the story right,” in the report’s lingo, if we fail to ensure that women are included? 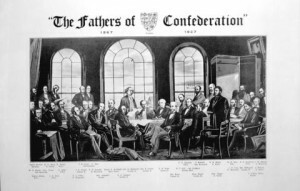 We should envision the story of young Canada as quite a bit more colourful and varied than the serious visages of the “fathers of Confederation” would have us believe it was. That room needs to be injected with Technicolor and light! Goethe’s last words purportedly were “more light, more light,” a statement that I have always found affecting because it so perfectly captures the essence of life. Similarly, the various shades of grey our early statesmen seem both to represent and be associated with – all those black-and-white photos – also cry out for more life. So let’s bring it on! By this I don’t mean that women are (or were, at any time) nothing but delightful birds of paradise; all the somber colours alone worn in the Victorian period would make that unlikely. What I mean is that leaving out the female perspective – especially in an era when the domestic, with which women were so closely associated, took up so much time and effort – is a bit like looking at a grainy image that lacks depth, richness, and, well, colour. Instilling those things is easy, once we look for and at the (not so elusive) “distaff dimension.” And while individual figures and aspects of that dimension have been looked at before, that hasn’t been done, as far as I know, in this medium. Let’s face it – we rely on the Internet for fast and easily accessible information these days; few of us regularly head to the library. There is justification, therefore, even in some repetition. Christa Zeller Thomas was a lecturer in the Departments of English and Women’s Studies at the University of Ottawa. Christa created the wonderful website Women of Confederation and had intended to post an essay with us this week on the life and influence of Sir John’s second wife Agnes (a subject she addressed on her own blog in October). Sadly, Christa died over the holidays. Though her untimely death prevented her from contributing to our project, readers interested in Macdonald and Confederation would be wise to consult her website. This post is the one with which she opened Women in Confederation in August 2014. “Canada’s 150th anniversary in 2017.” Parliament of Canada, accessed August 14, 2014. “Road to 2017.” Government of Canada, accessed August 14, 2014. 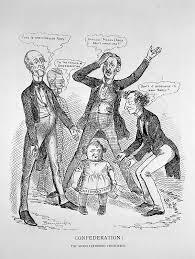 “Take a Walk in Sir John A’s Footsteps.” SirJohnA2015.ca, accessed August 14, 2014. “Transcription of a Speech By The Honourable Shelly Glover, Minister of Canadian Heritage and Official Languages on the occasion of the Launch of Public Consultations on Celebrations of the 150th Anniversary of Confederation in 2017.” Governemnt of Canada Canadian Heritage, accessed August 14, 2014. Dann, Moira. “Where were the Mothers of Confederation?” The Globe and Mail. August 28, 2009.